Easycooking: Kanji..or is it Rice Porridge?? Comfort foods mean different things to different people.For me,anything home-cooked[if by amma,all the more good]is comfort food.Having food by hand from a stainless steel plate is something I enjoy to the core.For Ajay,it is Kanji/Rice porridge,without any second thoughts.He cites a very cute incident which happened when he was young,to emphasize his point.He was an active member in the school sports team and used to travel long distance for camps and tournaments with the school team very often.Once,while they were camping in Trivandrum,sick of eating the hotel food,he was taking a walk around their hotel searching for something different.He saw a small restaurant or rather a car garage converted into a restaurant,and ‘the magical word’according to him-“Kanji thayyar”[Rice Porridge ready]. He ate to his heart’s content or so he says:).To this day,I can’t fathom how someone can speak so lovingly about Kanji. Another event which comes to mind while speaking about Kanji is a festival in our temple in Kayamkulam.After the ten day yearly festival,there is an event called Pejje Nishe[porridge,again;)].Early morning,people flock to the temple to have pej.Sitting pretty on the sand,plaintain leaves are distributed.Making an indent on the sand,leaves are placed properly and then pej is served,topped with chavli human,some upkari and then pickle.Though I am not a big fan of pej/kanji,this is one event I miss attending.Its just too good,tasty beyond words. So here’s presenting,a very simple fare. Wash the podiyari well under running water. Cook with enough water till well cooked. Retain the water and serve Kanji. Grind the coconut and green chilly into a coarse paste. In a kadai,add oil,splutter mustard seeds and add curry leaves. Add the sliced onions and sauté till they turn light brown in color. Add the ground coconut paste and stir well. Now add the cooked cow peas and add salt to taste. Stir till the water[if any] is absorbed and the dish turns dry. Remove and keep aside till cool. Roast a papad in an open flame till brown on both sides.Apply a drop of coconut oil. What is your comfort food?? ahaaa divya...superb comfort food..love them to have right now...nicely presented click..
What a feast divya! everything looks so simple and comforting! I am drooling over the pics... infact it looks more like a sadhya to me.I love kanji. 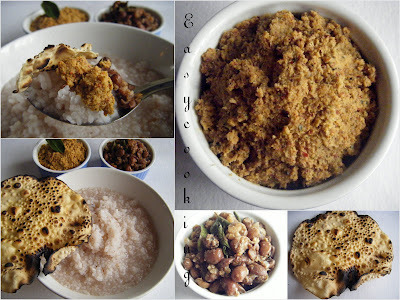 my fav combo is kanji and muthira/kollu puzhukku. I love kanji, payar and papadom. That is indeed a real comforting food. But have to admit i have not had them after getting married. If i serve it to my hubby and daughter them will run a mile. Divz.... Apart from Pej nd papad the other 2 things r very difficult to pronounce :P... nd about pej ah so soothing so much comfort..... I can have one vatte pej just with salt nd ghee... Tastes Yum.... Nd as u said it feels good to use in steel plates....;) as i dint have then here when i went on vacation i got some so tht i can eat Pej in tht :P.
truly a comfort food. have never tried this, will surely try once. An excellent cooling food. I love it with ur combinations.. lovely combo.! I too am ready to have kanji with all those delicious side dishes..No wonder your husband loves it. The kanji and puzhukku that they serve at Guruvayur is to die for. Nothing can beat that taste. Indeed a comforting food. I have my experiences also for this kanji. It tastes heaven in those situations. Try to participate in Think Spice - Think Red chillies event going on in my blog. as you said having it hot in the comfort of your home and mom is the best .. The chuttarachcha chamandhi podi is more than enough to tempt anyone to have the kanji, to top it the cherupayaru is bonus. Lovely clicks. My father makes kanji yum! !urs looks yum!! yes..a perfect comfort food..never tried making them, my mom used to though..
wow divya..thats really too good..love all these authentic dishes! Thats the perfect comfort food even for me Divya..Loved the story..can understand..kothippichu..what a spoonful with chammanthi and payar..hooo..
My favo Kanji with mango pickle it is so comforting and yum! Comfort Food Divya.Nice click.You can also name this as salty/savoury rice pudding ;). BTW,Apam balik is thicker & spongier than Soornali and has a nuttier taste.Soornali (sweet) tastes of jaggery but this one has stronger nuts taste.Instead of /along with nuts you can add bananas as well.Thanks for the comment -I simply want soornali now . A real feast indeed, looks so comforting. oohh this takes me back home. My parents love this combo..and seeing ur pics makes me miss them so much.. Mine is thayir chaadam/ curd rice.